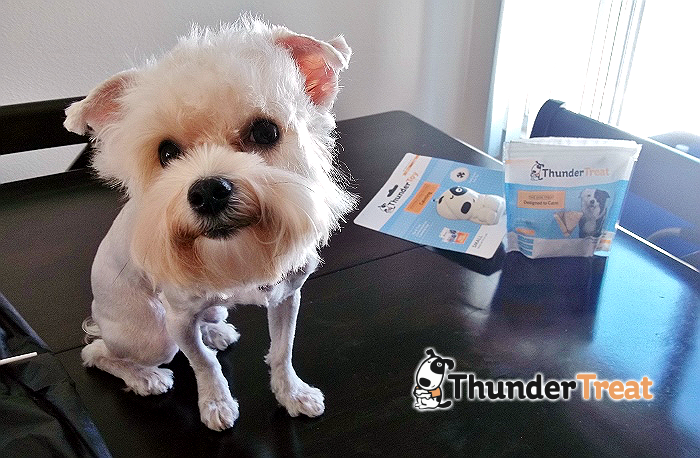 *** We received a product sample from Thundershirt for the purpose of this review. No further compensation was provided. All photos contained below are copyright Momma Told Me Blog 2013. Momma Told Me: Keep calm and pet on. At this very moment there is a 5.2lb Morkie snuggled, wet nose to my skin, beneath my arm as I type. It's no secret that our kids have fur, okay Nora- some of them have legit 'hair' too. But being a pet parent isn't all fluffy snuggles and wet kisses; it's hard work. While babies eventually develop verbal communication skills, we spend the life of our pets playing charades. Just this morning Jay questioned why the dog wouldn't drink her water; I promptly asked if he would down a bottle of water while he was crossing his legs, waiting to pee. Raising pets; feline, canine, or otherwise, takes a tremendous amount of patience. It can be easy to allow frustration to get in the way of a healthy relationship, but the rewards are often even greater. Last November, you may recall, I had the chance to try out a unique pet therapy device, known as the Thundershirt. Our feral adoptie, Frankie, was positive for a feline autoimmune deficiency, and often experienced extreme anxiety. He would 'self soothe' by grooming himself constantly, until this disturbed his daily eating habits and digestion. Thundershirts, produced for both dogs and cats, are designed in multiple sizes, with the inspiration of a mother's soothing, swaddled, embrace. The concept is for the animal to associate high stress situations (thunder, fireworks, separation) with the soothing, soft, pressure of the Thundershirt wrap. We tried the Thundershirt on all three, four-legged, animals in our home, with especially noticeable success on Frankie. Not only did he groom much less with the Thundershirt on, he was less skittish when it came to quick movements and new people. 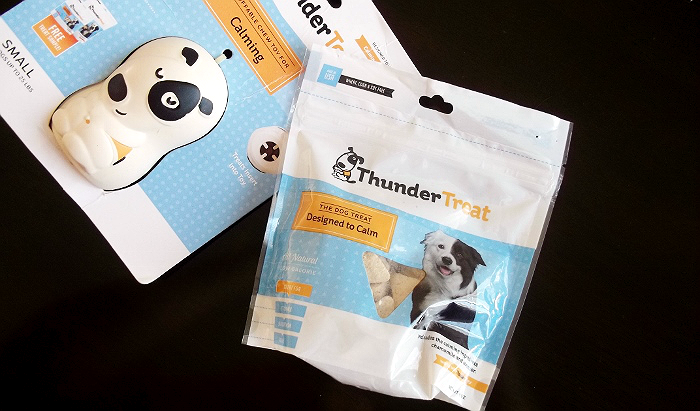 A month ago, Thundershirt reached out again with a new addition to their brand, ThunderTreats, and the companion ThunderToy, for canines. While the ThunderToy comes in 2 sizes (small: less than 25lbs, and large: more than 25lbs), Nora just tips the scale at 5lbs, and does not have the jaw expansion to play with either. This was a bummer, as the ThunderToy, chew toy for dogs, has a specially designed, hatched, stuffer that actually holds the unique triangle ThunderTreats in place for a delayed release. 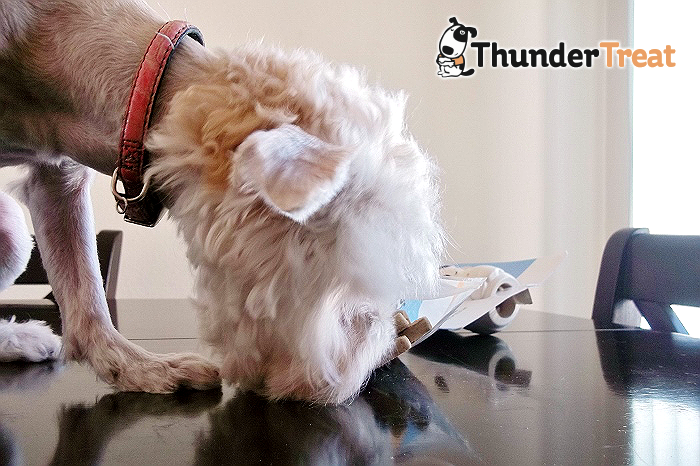 Thankfully, the unique blend of ThunderTreats were not too big for Nora to sample- and boy did she sample! When it comes to food, Nora is a picky eater. We do not feed her human food, and she has never had wet food- literal treats are her 'treat'. We permit her to chew on anything from rawhide and bacon flavored chews to traditional biscuits, so long as her tiny jaw can handle it; but she usually turns her nose up. This time her nose was turned up, but in the direction of the bag of ThunderTreats. These bite sized triangular biscuits are 3x the size of her little bites kibble, but crumble easy enough chew. Made with a unique blend of soothing chamomile and lavender, they have a lite herbal aroma and are intended to slowly calm your pup over time. 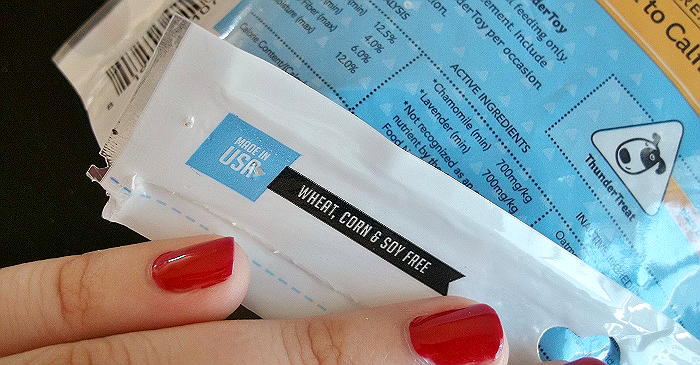 ThunderTreats are also made, and exclusively sold, in the USA, and entirely wheat, corn, and soy free. Nora knew these treats were for her, immediately. Before I'd even broken the seal on the zipper pouch, she was sniffing and licking the bag. Naturally, I made her sit, and wait, a solid 15 seconds before presenting the first ThunderTreat to her. With 3 swift chomps the triangle was gone, and my pup was attentively staring back up at me. Like most treats, these are not intended to be your pup's sole dietary source of 'food,' so I was certain to limit her portion to a suggested serving.....But the bag did end up on the table during the photo-shoot, and Nora did help herself to an extra before I caught wind of her covert snacking. 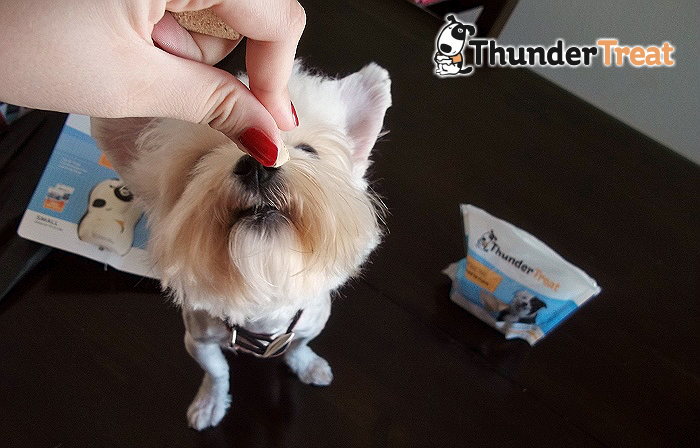 ThunderTreats can be purchased separately, or you may receive a complimentary 4oz bag with your ThunderToy purchase. I've found that ThunderTreats stuff nicely into the puppy size Kong we use for Nora; and keep her engaged for a decent period of time. I can't speak to the immediate effects of the chamomile and lavender, but having a treat on hand to occupy your pup is always a great idea for travel, and stressful situations. 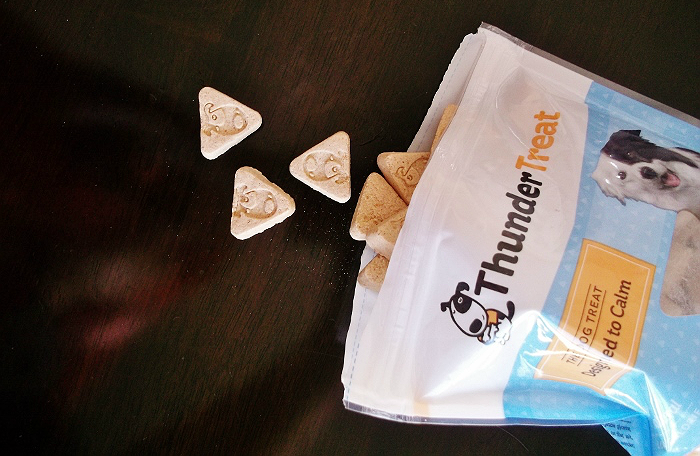 Why not give ThunderTreats a try? What Daughter Says: Don't get frustrated with your pets, give them positive outlets for their energy and anxiety with toys and soothing treats. One Momma Told Me reader will win a ThunderToy and ThunderTreats prize bundle in their size of choice. Our dog would most benefit from the ThunderCoat but we also love the ThunderSweater. I have cats, so definitely the ThunderShirt for cats! I think my dog can benefit from the thundercap, he gets very upset from the flashes from lighting. This could help him. My boy scaredy cat would benefit from the Thundershirt for Cats. My little guy could use the ThunderSpray on occasion. My dog would benefit from the Thunder leash! I need that desperately! My Dogs Would Benefit Most From The Thundershirt! the thundershirt for my dog.. she shakes when it storms outside. Our dogs would benefit most from the (Pink Polo) Thundershirt. I think my dog would get the most benefit from the Thunder Leash. Thank you! 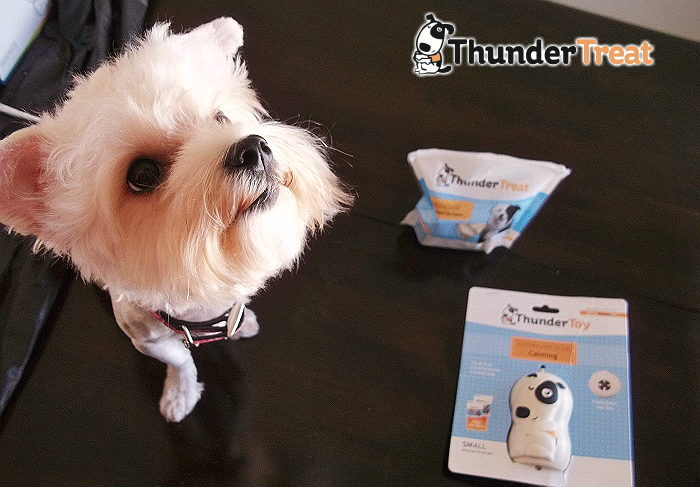 My boss' dog would like the Thunder Toy and the treats! I would love to try the Thundershirt on my dog but it might be too hard to get on him so the treats might be better. He is afraid of thunderstorms. I think the ThunderSpray could help. The thundershirt! My shihtzu hates thunderstorms! The Thundershirt without question. My enormous 140 lb. baby is terrified of all loud noises! My dog would benefit from the Thunder Toy because she needs mental stimulation. I have 2 dogs, one of which has had bad anxiety issues since he was a puppy. I would definitely love to win this for him so that we can help ease his anxiety!! My dog Ted is a 90 something pound fuzzy wuss. He hates thunder and glues himself to my side every storm or firework night. I've wanted to try the thundershirt on him for some time now since he's a dog that really loves being hugged and being as close to someone as possible. So the pressure of the shirt would most likely benefit him. My son's dog would benefit from a large ThunderToy! I think she'd like the Thundertoy. My pup is terrified of storms. I would love to have a ThunderShirt for her.